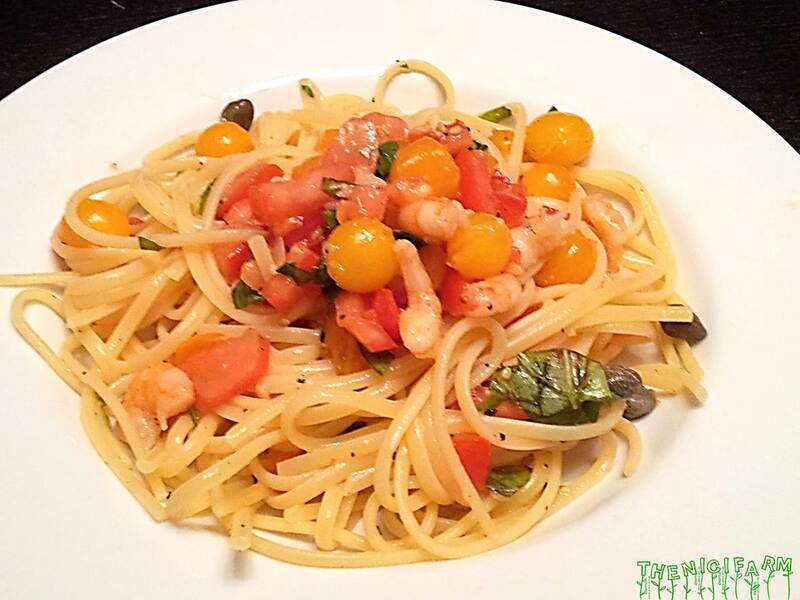 You will love this light, Mediterranean, 15 minutes spaghetti dish! Cook pasta in salted water until al dente. Meanwhile heat 2 tbsp olive oil in a small pan and fry garlic and shrimps until tender, about 5 minutes. Season with salt and pepper while frying. Mix all ingredients (except spaghetti) in a large serving bowl and squash out the juices of the cherry tomatoes with the back of a spoon. This will make the good sauce of the spaghetti dish. Yes, the ingredients are cold, but they will become hot while mixing with the hot spaghetti. Rinse spaghetti and add to the rest. Season one more time and add all the good olive oil. Mix well and quick for it to stay hot. Use more olive oil if it is too dry. Be sure to fetch all the good stuff from underneath while dividing onto plates. This is one of my favorite dishes!! YUMMY….